You can't take your eyes off Charlie Plummer in "Lean on Pete." He plays a suddenly orphaned teen who drifts from Oregon to Wyoming, looking for a sympathetic aunt. Plummer spends much of this story with a racehorse named "Lean On Pete," owned by Steve Buscemi, a no-nonsense horse racer/trader. When it appears "Pete" will go to the glue factory, Plummer and the horse take flight. Their road trip leads to a series of mean streets. "Lean on Pete" avoids the cliche of the bond between a boy and his horse. Instead, a good kid leading a grim life looks for someone to lean on, and in turn, to lean on him. "Lean on Pete" avoids sentiment, a bare bones film showcasing a brilliant performance. 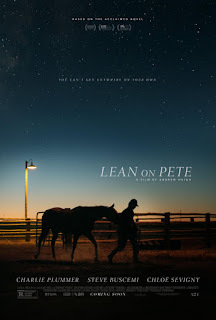 "Lean on Pete," rated "R," 3½ stars. Does it deliver what it promises? A kid on a quest. Is it entertaining? Great performance. Is it worth the price of admission? You bet.